Productivity can be enhanced in various ways. You want to be rested, nourished and, of course, organized. It is difficult to get anything accomplished if your workspace is in disarray. There are many ways to furnish and optimize a commercial space for rent to promote efficiency. Ten of them are explained below, so there are fewer barriers to getting things done in the office. Desk size is a major consideration for any workspace. If it is too small, the clutter will destroy any prospects of productivity, and you will waste valuable time looking for and moving items. The desk should be large enough for a computer, phone, notebook, binder, or any item or equipment you use during a normal day. Consider any tools used as well, especially if you’re an artist. Corner and L-shaped desks tend to have more surface area, and these configurations can boost productivity and comfort if your office space for lease permits it. Productivity is a real challenge if you are uncomfortable. To maximize your comfort, tend to the ergonomic aspects of your office space, arranging the computer and office chair so there’s a direct line of sight with the computer screen. Both hands should comfortably reach the keyboard. Sit straight up and make sure there’s enough back support. If you can limit back, arm, and eye strain, then less time is spent trying to be comfortable and more of the day can be devoted to getting work done. Your office space should allow you to reach notes, pens, planners, a printer, files, and anything else on your desk or in its drawers. It shouldn’t be a strain to get to office supplies. The exact configuration may vary based on your preferences, but immediate access to equipment and supplies, and knowing where everything is, will make your day much easier. Also, choose the type of storage space wisely. Smaller storage bins and drawers are easier to organize and search through. Larger ones will increase the time spent looking for items that should be within reach. When it comes to offices, simple seats or dining chairs won’t do. These are not designed to be sat in for long periods of time. Typical office chairs have a swivel design, wheels, high backs, and adjustability. Your chair should let you move freely about the workspace. Adjustable height is a convenient feature to maximize comfort any time of the day. The atmosphere of a workspace is a big influence on productivity. A temperature that’s cool but not too much so, or too warm, boosts comfort. The office lighting should be bright, so you stay awake and alert all day. Good lighting also helps to prevent eyestrain. Daylight bulbs are ideal for office rentals and even home offices, where soft white bulbs used in apartments may not promote work efficiency. A full-spectrum lightbulb can also be sufficient. It can prevent seasonal affective disorder as well. 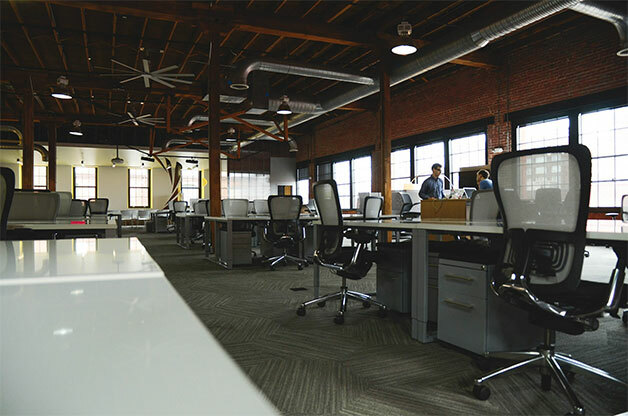 There are other ways to optimize the atmosphere of your office space for rent. Music is effective for staying focused, if the circumstances permit. Any genre of music will do; it all depends on your taste. Some people even play background noise to limit disruptions. Sound can put your mind in focus and personalize the work environment, so you are motivated and stimulated. Other people are motivated by smell. Essential oils in the office can help keep you mentally alert and awake. Aromatherapy is a natural way to boost energy, so being productive consistently throughout the day is a more attainable goal. Clean up your office space at least once a month, or at least take some time to sort things. During this monthly maintenance, discard supplies you don’t use. Review what is irking you during the work day and slowing you down, and adjust the workspace accordingly. Clean up the desktop at the end of the day as well; it will enable you to start fresh the next day. Many offices for lease use traditional cubicles. These allow for more privacy and minimize distractions from other co-workers. An open layout provides more opportunities for employees to socialize and collaborate. For some, this concept inspires creativity; however, it can be distracting for others, as the work environment tends to be noisier. Storing everything electronically (and of course backing it up) is not just efficient. It also reduces the mess, while helping your office look neater. Using less paper means fewer pages to sort through for information. You also spend less on supplies. Organizing your computer file system, and deleting documents, files, and folders not used, is as effective for productivity as keeping your desk in order. Set up a system for managing e-mail. Tend to the bookmarks in your web browser too, and you may be surprised at how much more productive you can be. Organizing all your computer media and documents can save lots of time. Working and eating are not often mentioned together, but the idea is worth mentioning. Healthy, nutritional foods such as vegetables, fruits, or even protein bars help raise the energy level. Snacking between tasks can therefore boost your productivity. Avoid sugars and fats, though, as these can perk you up for a short time, then cause you to crash. Finding sufficient commercial property for rent is one step to setting up an office. Optimizing it for productivity is a separate challenge. These tips are proven to save time and help people work more efficiently. You could be wasting valuable time by not optimizing the workspace, minimizing distractions, and giving yourself the opportunity to be comfortable.